History : Hohmann & Barnard, Inc., We Anchor the World! 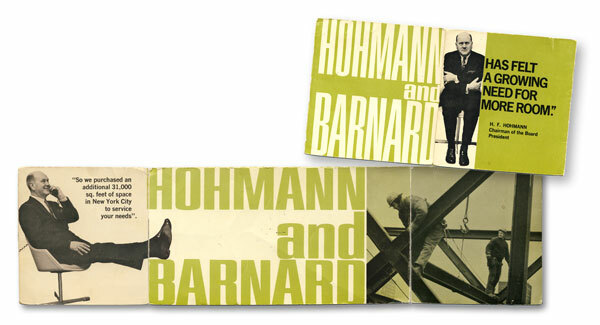 Hohmann & Barnard was founded in New York City, NY by Herman Hohmann in March of 1933, in the Great Depression era, with financial participation of the Barnard family. Originally the main business consisted of the manufacturing of window sash weights, which were built into the frames of windows to facilitate proper opening and closing. The business was affected by World War II, but Mr. Hohmann began doing light manufacturing for the government to sustain the business during the 40's. In the 50's, Mr. Hohmann bought out the Barnard family interest, and began to take advantage of the economic rebound and the strong New York area construction market to focus on masonry accessories. Hohmann & Barnard products began to be used on many of the massive housing projects that ensued in the 60's, including LeFrak City in Queens and Co-op City in the Bronx, which is still considered the largest cooperative housing project in the world. With the passing of Mr. Hohmann in 1969, second generation Hohmann family members began to take the reigns, and advanced the company into more diversified areas of masonry reinforcements and accessories, as well as the special fabrication of stone anchoring systems. The company moved its headquarters to Hauppauge, NY, in 1972 where it remains today. The 80's saw the construction of numerous skyscrapers with marble and granite facades, with Hohmann and Barnard becoming the industry leader in façade anchors, with design and fabrication of anchors for such notable buildings as the AT&T Headquarters (now the Sony Building) and the IBM Tower, both on Madison Avenue in New York City. The latter was well-documented at the time in a New York Times article (link to article). In the 80's H&B also began to advance the quality of masonry wall construction with a series of innovative patented products. These products were designed to enhance the performance of masonry wall construction, while offering ease of installation and labor savings. The company developed a countrywide network of quality distributors, and also began to gain international exposure with many large overseas projects, primarily in the Middle East. This continues today, with recent projects such as the Dubai International Airport. While the second generation of Hohmanns remained with the company, and still participates fully in the day-to-day business, the third generation has also been fully involved since the early 90's. In that period, innovation and growth have continued with numerous proprietary products being developed and entire product lines added, including a wide variety of flashings, air barriers, residential products and an array of foam and rubber products. Hohmann and Barnard, Inc. is committed to enhancing and promoting the benefits of environmentally sound, masonry wall construction. On May 1, 2008, Hohmann & Barnard was acquired by Mitek Industries, Inc., a subsidiary of Warren Buffett's Berkshire Hathway, Inc. H&B continues to operate as a separate subsidiary of Mitek Industries, and envisions an even greater growth trajectory going forward. Download a PDF of the press release. On October 3, 2008, Hohmann & Barnard acquired Blok-Lok, LTD., one of the leading manufacturers of wire reinforcement and ties for masonry in Canada. 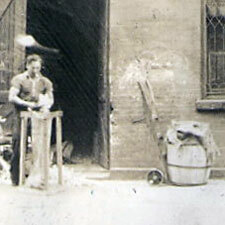 Blok-Lok, LTD. has built a 50-year reputation for excellence in new construction, restoration, and preservation. Download a PDF of the press release. On March 31, 2010, Hohmann & Barnard announced that it acquired the assets of Dur-O-Wal from Dayton Superior Corporation. Dur-O-Wal, one of the pioneers in the masonry reinforcement industry, has established one of the most well-known brands, widely recognized in the masonry construction and architectural communities. The transaction closed April 23, 2010.Download a PDF of the press release. On April 13, 2011, Hohmann & Barnard announced that it acquired Sandell Industries Inc, a company established over fifty years ago; with a reputation for innovation, Sandell manufactures state of the art flashings, drainage products, and building envelope accessories for the residential and commercial construction industry. Another component of the acquisition was Diedrich Technologies, a leader in high-performance detergent products for building restoration and maintenance. Download a PDF of the press release. On August 1, 2013, Hohmann & Barnard announced that it completed the purchase of the assets of Astoria, NY based RKL Building Specialties Company. RKL manufactures and distributes custom stone and masonry anchors and accessories throughout the northeast, with an especially strong presence in the New York City market. Download a PDF of the press release.